A wonderful thing will happen this spring at dead of night down on the shore in front of the Park Hyatt in Abu Dhabi. An ancient natural cycle – something repeated over many, many thousands of years – will be completed when a hawksbill turtle hauls herself onto the beach and labouriously crawls to the soft sand just above high tide mark. There, in full view of the hotel, which opened in December 2011, she will use her flippers to dig a shallow pit in the sand. Then she will lay up to 100 eggs in it. It’s something immeasurable generations of her direct descendants have done before her in this very place. It’s remarkable that this is happening in the supercharged Gulf, in one of the most prosperous of the emirates which has seen massive building development over the past 20 years. And yet the turtles continued to nest, and the hatchlings managed to make it to the sea even while building work for the hotel proceeded two years ago. 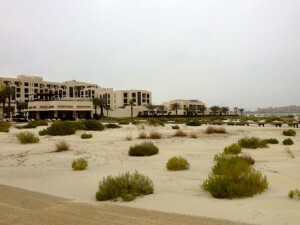 With turtle populations under extreme pressure from man’s activities around the world, the conservation program on Saadiyat Island in Abu Dhabi is a shining example of how building, if it has to happen, can be moderated and controlled so the turtles survive in their ancient territories. Only time will tell if the turtles survive on Saadiyat, although the early signs are good. Since a monitoring programme began in 2010, run by the environment team of the government’s Tourism Development and Investment Company (TDIC), more than 600 hatchlings have made it to the sea, and that includes in the period since the hotel has been fully open. Are we in time to save a magnificent sea creature that only comes ashore for one purpose, which is to lay its eggs and let its progeny take a chance against so many hazards? This is one of three programmes I’ve seen which suggest we just might be. I first stood on a turtle nesting beach in 1987, at Dalyan in Turkey. I wrote this for The Times. Those were pioneer days for turtle conservation, and Turkey was rightly commended for stopping hotel development at this particular site and saving it. Turtles continue to nest on the beach, although there are issues about the way it is managed as a tourist resource. Another good example of turtle conservation I’ve seen for myself is in Costa Rica, where the government halted development around important nesting beaches and brought in a strict protection regime. What has happened in Abu Dhabi, and other places in the UAE, is more ambitious, and riskier. In contrast to Turkey and Costa Rica, the government did allow this hotel, and the adjoining St Regis Resort to be built. And there’s a more development to come. This is the island of culture, soon to contain a huge artistic hub centred on the Guggenheim and the Louvre Abu Dhabi. The secret, although perhaps it’s not so secret as you can quickly work it out for yourself, is in the planning. TDIC created a buffer Dune Protection Zone, restricting resort development to at least 60 metres back from the seaward edge of the coastal dunes. This buffer served as a physical barrier between where construction was taking place and the nesting areas. Turtles continued to nest even during construction of the now open St Regis and the Park Hyatt. With building work done, the nesting sites faced an even bigger peril. How could they possibly be left undisturbed with thousands of guests making their way to the sea and enjoying the beach? The answer was to lay boardwalks down across the dunes to the shore. It appears to work. On my visit, walking the boardwalks made such sense it’s hard to see how anyone would want to go wandering off into the dunes. TDIC, which monitors the turtles under its Hawksbill Sea Turtle Conservation Programme, the only one of its kind in the Arabian Gulf, gives resort staff, who include lifeguards, beach cleaners and beach security patrols, training on how to identify turtle tracks. They are told how to manage the beach during the nesting season. The staff are said to be enthusiastically involved with the programme. The turtle is better protected now than it ever was in old Abu Dhabi. Nesting locations are logged and avoided by beach maintenance crews. In addition all beach furniture is moved off the beach at night, to keep the way to the sea clear. At the two resorts guests are informed about the turtles and their nests. They are asked to switch off outdoor lights when they are not outside, to close their curtains at night to minimise light spill, refrain from going to the beach after dark and avoid turtle tracks so that they are not disturbed. The tracks can provide valuable data to the monitoring teams. Children are told about the turtles in kids’ clubs on the beach. When the baby turtles hatch, usually at night between 50 and 60 days later, they break out of their eggs, approximately 50cm underground, and dig their way up through the neck of the nest. 65 successful hatchings is a normal result for a nest of around 80-100 eggs. The babies then make their way to the shore, orienting themselves in the dark by the glow off the water. However the siren call of strong lights and noise may distract the baby turtles, leading them in the wrong direction and away from the sea. Night lighting at the hotel is reduced so that hatchling turtles are not diverted. Even on the darkest beach, however, roughly 10 turtles from a nest are likely to go in the wrong direction. On Saadiyat the conservation team aims to ensure that all the baby turtles make it to the ocean. Once in the water the baby turtles swim for a full 24 hours to get as far away from the shore as possible, powered by the reserves of the egg yolk they’ve ingested. Then they float amongst the currents to be taken out into deeper waters to mature. Two out of seven species of marine turtles, the hawksbill (Eretmochelys imbricata) and the green turtle (Chelonia mydas), occur in Gulf waters.The hawksbill is listed as critically endangered on the International Union for Conservation of Nature’s Red List, as its worldwide population has declined sharply in the 20th Century. This decline is due to various factors, including coastal development, urbanization, industrialisation, and the loss of nesting habitats and human interference. Saadiyat Island is a leading example of how large-scale projects can be delivered while protecting, and even enhancing a delicate environment. It’s also a very good case study showing how tourism can be developed without damaging one of nature’s great annual events.